He is the latest of several secular activists taken into custody this month. camera (Roger Anis via AP, FILE) In this June 9, 2017 file photo provided by Roger Anis, prominent activist and blogger Wael Abbas signs a copy of his book, "The theory of leaving the bowl,"?� in Cairo. Egyptian security officials said Abbas, known for documenting police abuse, was detained, Wednesday, May 22, 2018, the latest in a new wave of arrests since elections earlier this year. A prominent Egyptian blogger and human rights defender was arrested today, making him the latest in a campaign that has taken several secular activists into custody this month. 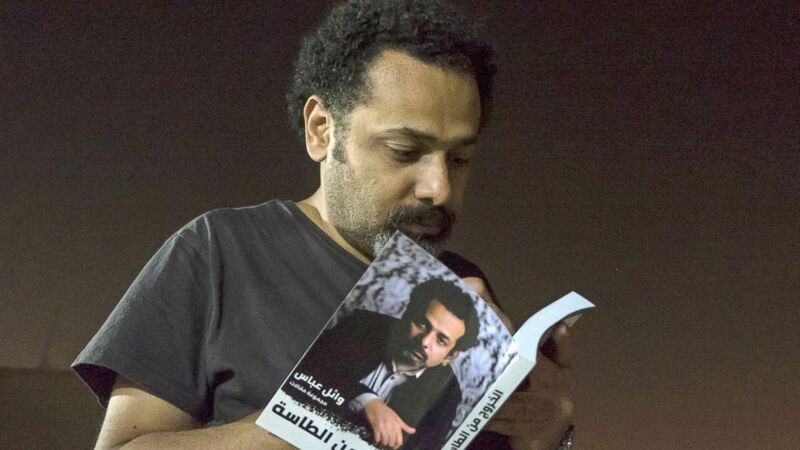 Egyptian security forces raided Wael Abbas’ Cairo apartment at dawn without showing a warrant or giving a reason, according to his lawyers. He was then blindfolded and taken in his pajamas to an undisclosed location, according to a statement by his authorized defense team at the Arab Network for Human Rights Information. Among the things confiscated were his laptop, telephones and some books, according to the organization. “He [Abbas] was known as someone who has critical words and opposition views, which is a crime or a reason for reprisals against the one who holds them only in police states,” is known to be a man of a critical word and opposition views, something that is not to be criminalized or avenged for except in a police estate,” the Arab Network for Human Rights Information statement added. Abbas, 43, was one of the earliest to document torture practices by the Egyptian police under then-Egyptian leader Hosni Mubarak. For his efforts in documenting human rights abuses, Abbas won several awards including the U.S. Knight International Journalism award in 2007. Authorities in Egypt have intensified their campaign against critical and independent journalists since the March presidential elections, according to the U.S.-based Committee to Protect Journalists (CPJ). The circumstances of his arrest are similar to that of Shady Abu-Zeid, the ANHRI said, referring to the satirical video blogger who was also arrested at his house by plainclothes officers at dawn earlier this month. Abu-Zeid’s whereabouts were unknown until he showed up the next day before a state security prosecutor in Cairo. He is being charged with spreading false news and joining a terrorist group. Other prominent secular activists were also arrested this month. Haitham Mohamedeen, a long-time labor lawyer was arrested after modest but unusual protests at Cairo’s metro station over a price increase in fares. He is accused for joining “a banned group” and “inciting terrorist acts” on grounds of inciting illegal protests against the rise of metro ticket prices. Amal Fathi, an online activist, was arrested after posting a video lashing out at the state for various reasons including the issue of sexual harassment faced by the majority of women in Egypt. She faces accusations of spreading false news and insulting an Egypt state institution.